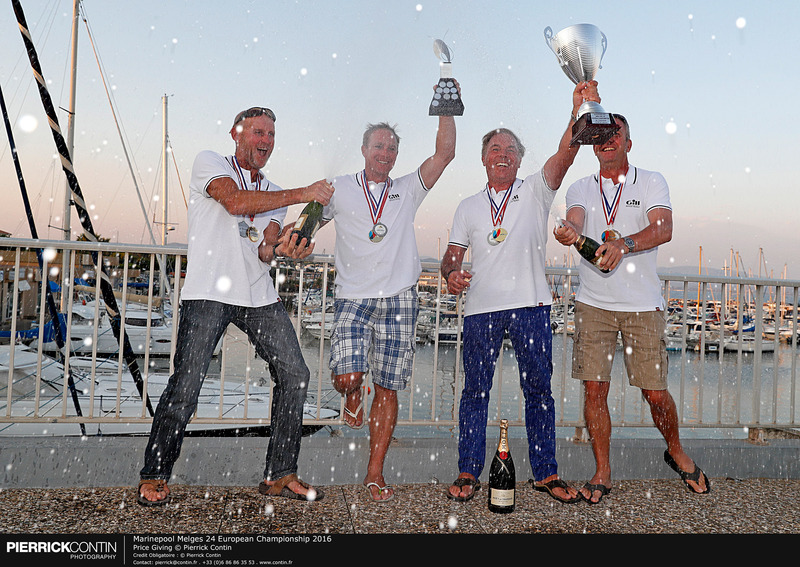 September 9, 2016 – Hyères, France – After five days of challenging and demanding sailing, the Marinepool Melges 24 European Championship, hosted by COYCH with the cooperation of IM24CA, came to an end. Yesterday, EFG (SUI) by Chris Rast, already reigning Melges 24 World Champion, earned such an advantage over its followers that was mathematically proclaimed 2016 Melges 24 European Champion and didn’t even take part to today’s race. The crews couldn’t wait to get in the water and, even if there were light breeze conditions, after postponing the initial warning, the Race Committee let the boats sail for the twelfth and last race of the Championship. In a race characterized by shifty and light wind conditions, mostly coming from 115°, tactical calls are what have made the difference. Today’s regatta was won by the Hungarian crew helmed by Robert Bakoczy, FGF Sailing Team (HUN) that claimed their first victory in the last race of the Championship. The Italian crew of Bombarda by Andrea Pozzi, with Giulio Desiderato as tactician, crossed the line in fourth position, and confirmed itself in the second position of the overall ranking, followed, with a gap of nine points, by another Italian, Angelo Di Terlizzi’s Marrakech Express helmed by Matteo Ivaldi, who was also calling tactics by himself. The respectful and friendly environment that characterizes the Melges 24 Class was witnessed until the end of this competition when, the reigning Melges 24 Corinthian World Champion Tõnu Tõniste, owner-driver of Lenny, on the finish line immediately went to congratulate with the new European Corinthian Champion Geoff Carveth. “They raced in a wonderful way in these days and they deserved the victory in the Corinthian division of the Championship thanks to a great final leg”, declared Tõniste, when back to the docks. 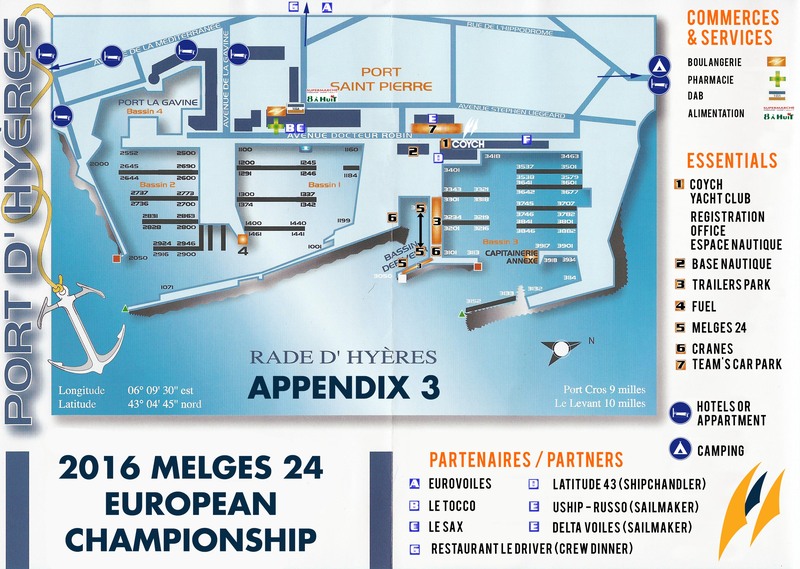 After Hyères’ event, which has been considered by all the participants one of the greatest in the recent history of the Melges 24 class, the crews will move to Luino (ITA) in October, for the Lino Favini Cup, looking forward to the main event of the year, the Melges 24 Worlds in Miami, that will take place from November 26th to December 3rd. With this event, Melges 24 Class confirmed its position as one of the most active classes in the sailing world and the organizing machine is already at work for another great event. “We’re getting ready for the Melges 24 World Championship that will be host in Helsinki next July. We expect to have 80 entries in a venue that will host us with the beauty of its landscapes, the hospitality of its people and weather conditions that are perfect for sailing”, declared Tomi Hakola, treasurer of International Melges 24 Class Association.